The first 30 days after being discharged from a hospital visit are vital to a patient’s recovery. Unfortunately, not all Americans are aware of the risks that remain after a hospital discharge. This is especially true with the elderly, who often need care and support to avoid complications that can lead to re-admission. At Visiting Angels, our elderly care professionals regularly assist seniors as they transition from the hospital to home. And with hospital readmission rates as high as 25%, we know how important being proactive and attentive can be after a hospital visit. Below, we’ve listed a few elderly care tips on the most common risks for hospital readmission, and how family members who help out with elderly care can help make the hospital-to-home transition as safe as possible. Medications, which saves lives in the right dosages, but can quickly lead to readmission if mishandled. Injury, which can occur due to weakness, disorientation, or mobility issues. These issues are sometimes caused or made worse by the condition that led to your loved one’s hospital visit. Over-exertion, which can trigger relapses of certain conditions, or which may trigger new conditions that your loved is vulnerable to after their hospital stay. What medications and at-home care procedures are recommended for your loved one? What are the biggest specific risk factors you need to be aware of for your loved one’s condition? What steps can you take to mitigate these risk factors? What kind of follow-up care should your loved one expect? Is at-home care by family recommended, or would your loved one be better served with professional assistance? If possible, you should start making an elderly care plan for your loved one several days before their discharge takes place. Sometimes, however, this is not possible, so it’s important to review what steps you should take. Make sure that family members or elderly care professionals are available to monitor and support your loved one 24/7 during the first 30 days, then coordinate to create an elderly care schedule for your loved one. Educate family members and caregivers about medication dosages and schedules, proper care procedures, and risks they should be aware of. Determine what materials you’ll need for your loved one’s care and make plans to procure them. Assess your loved one’s home for any areas that may increase the risk of injury or overexertion during care. See if there are ways to alter these areas to increase at-home safety. 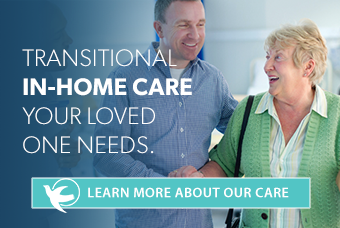 Once you have your loved one’s hospital-to-home elderly care plan in place, put it in action. Be sure to provide your loved one with all of the care and support they need for their recovery. If you are short on time, feel overwhelmed, or simply wish to increase your loved one’s chance of a successful recovery, consider enlisting the services of a professional elderly care agency. At Visiting Angels, we offer our Ready-Set-Go-Home program for hospital-to-home transitions. This program is specifically designed to reduce the chances of re-admission and is administered by professional caregivers. To get more hospital-to-home elderly care tips from Visiting Angels, call 1-800-365-4189 today to connect with your local office.